Over the summer, Queen Bee's Bar and Grill in downtown Paynesville transitioned to a more family-friendly hive, expanding its space with the construction of a new addition. Family-owned and operated by Doris and Tom Wendlandt since 2000, the newly renovated bar and restaurant stayed open throughout the construction, from April to August. A 78' by 48' addition - with a basement the same size, which will be used for storage - was built, raising the maximum occupancy to 550 persons. The new reception area will host wedding receptions, anniversary gatherings, birthday parties, and other events. The addition includes a 750-sq. ft., hardwood dance floor. Windows add natural light to the space. Also added were two new, handicap-accessible restrooms. 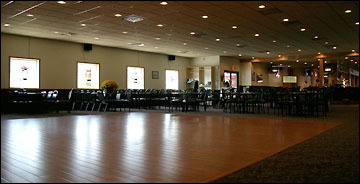 Queen Bee's Bar and Grill in downtown Paynesville - owned by Doris and Tom Wendlandt - added a 78' by 48' addition this summer, including this hardwood dance floor, in order to host larger events. The bar was removed to allow for kitchen expansion and was rebuilt at the center of the restaurant. On the end opposite the addition, the previous dining room now houses a sports bar with four pool tables, dart boards, video games, a big screen TV, and six other televisions. The touch-tone jukebox is connected to Internet to give a wider selection of music. "The reason we (remodeled) was to provide Paynesville, the downtown area, with a place that would be inviting to the community," said Doris Wendlandt. "We want to do business with all walks of life." The Wendlandts' five children involved themselves inside and outside the restaurant with painting, cleaning, plumbing, and installing air conditioning during the remodeling. "Between my husband and I and my children, we worked non-stop," said Doris. The menu will soon be expanded to include evening dinners. Entrees will feature steaks, alfredo pasta, smoked pork chops, walleye, and shrimp. Regular dinner specials will be offered on Mondays, Wednesdays, and Fridays. Taco Tuesdays and Thursday noon buffets will continue. A children's menu is "in the works right now," said Doris. Doris, who has worked in the restaurant industry since she was 13-years-old, said that since the beginning of August, she has been very busy with new business due to the renovation. "It's a whole new environment," said Doris. "It has a softer appeal to it, I'd say." Queen Bee's Bar and Grill is open Mondays through Fridays from 9 a.m. to 2 a.m. and on Saturdays from 8 a.m. to 2 a.m.